So here's my new rig, freshly built about 2 weeks ago. 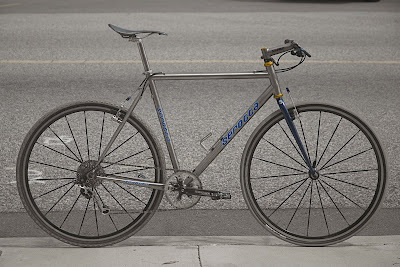 Honestly, I did not have "too many" weight restrictions in mind while building this, however they were always lingering around, like any other bike nerd. Also, when it came time to weigh in, I was pleased to see the results of 18 lbs. (flickering between a tenth), so I could contribute to this site without any scrutiny. Anyways, this is my second cross bike, first was an carbon/Al Alan, and the Serrota Legend just has no comparison. I hope I don't get bashed for have flats on bike, I come from a long history of mt. bike racing. I must say, I prefer it better. Headset: Chris King 1 1/8"
The bike is rad. Between riding through the streets of San Francisco and crossing the bridge into Marin County; this bike performs phenomenally.